Liu Kang was born and educated in China. In 1929-1933 he studied in Paris and his works were also exhibited there. He returned to China in 1933 to take up an appointment as professor of western art in Shanghai. When the Sino-Japanese War broke out in 1937 he moved to Muar, Malaysia. After the war he moved to Singapore. His awards include the Public Service Star (1970) and the Meritorious Service Medal (1996). 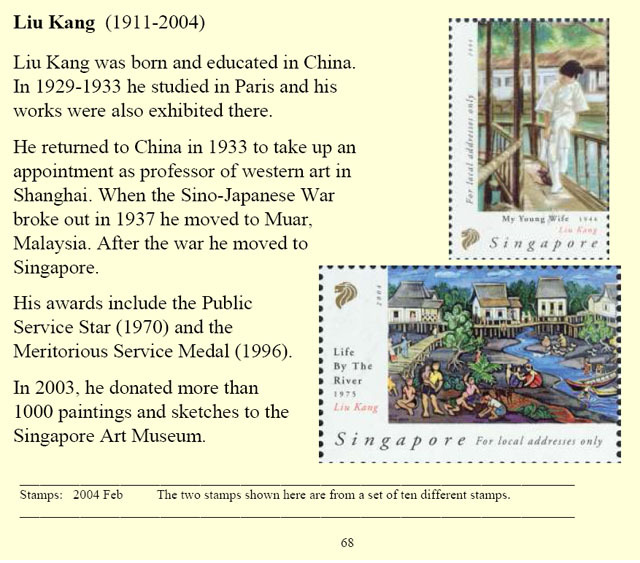 In 2003, he donated more than 1000 paintings and sketches to the Singapore Art Museum. Stamps: 2004 Feb The two stamps shown here are from a set of ten different stamps.